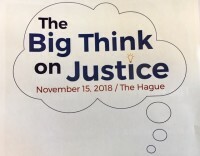 On invitation Xandra Kramer participated in the Big Think on Justice, organized by the Knowledge Platform Security & Rule of Law, the Dutch Ministry of Foreign Affairs, and The Pathfinders’ Task Force on Justice, taking place in the Hague on 15 November 2018. This meeting gathered justice experts from civil society and justice institutions to provide input to a Task Force report 2019 aiming to improve access to justice for all at a global scale. She contributed to the session on Innovating and Investing in Justice. This focused on the solutions that people need, strengthening local delivery, system innovation and overcoming institutional barriers.